The Airbus H225 Super Puma (formerly the Eurocopter EC225 Super Puma) is mainly a civil aircraft manufactured by Airbus Helicopters. It serves as an offshore passenger transport for the oil and gas industry and has seen service as a search and rescue craft. H225s that are used in military applications carry the EC275 Super Cougar or Caracal designation. Deliveries of the Super Puma began in 2004. The H225 is a larger version of the AS332 Super Puma. Announced in the late 90s it brought a number of advances over the AS332. Its development was spurred-on in part by the 1973 oil crisis, which demonstrated the need for more capable aircraft in offshore roles. 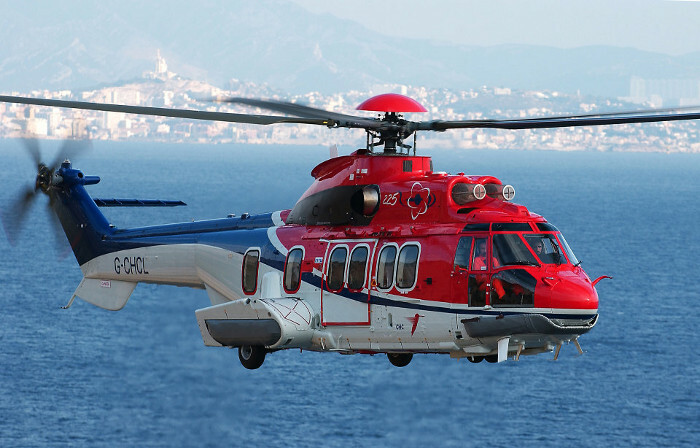 The H225 is one of the most modern members of the Super Puma family, which fall into the 11 metric ton (24,251 lbs.) class. These helicopters are equipped with twin engines that allow for an initial take-off weight of 10.4 metric tons. The H225 brings a new main rotor system, a reinforced main gearbox and integrated display and piloting systems to the Super Puma family. Making it a significant upgrade. The engines in question are the Makila 2A1 units. The new Spheriflex main rotor has a five-bladed design and the all-new glass cockpit has six large, redundant multifunction displays. It’s thanks to the H225’s 5000 lbs fuel load and guaranteed flight time of five hours that it has found a home in offshore transport and search and rescue. In addition to the crucial range advantages it has, the H225 has an advanced autopilot system. This unit is notable for the fact that it was designed from the ground up to be a helicopter autopilot system. Previous systems started life in fixed-wing aircraft and were simply adapted. The advantages of this have raised the bar for helicopter automated flight systems and the H225 has distinguished itself with automated hoisting operations that are beyond the precision possible with other systems. The H225 is in operation as a V-VIP craft in more than 50 countries, including several heads of state. Brazil alone has placed an order for 50 EC725 variants through the Brazilian Airbus subsidiary Helibras. The H225 is set to be manufactured at least until 2030, but Airbus has already named a successor code named “X6”. It seems as if the H225 and the X6 will briefly overlap manufacturing times, to ensure a smooth changeover. Do you want to comment the Eurocopter H225 / EC225 Super Puma / EC725 Cougar helicopter?